The Destroyermen: RUSSELL's First Test "At War"
Prior to leaving the Hawaii area, all of our strike group participated in a three-day anti-submarine warfare exercise. The exercise posed a particular challenge for RUSSELL, as we had only been at sea for eleven hours at the start of the exercise, and the exercise began with no-holds-barred war at sea without any workup to hostilities. So, after leaving our families behind in the afternoon and rushing off to get gas on the way to the exercise area, the crew needed to be ready for a fight at midnight. Anti-submarine warfare is probably the most challenging mission a ship or strike group can perform, especially when done well. It involves nearly every asset and tactic you can imagine, as ships and aircraft perform a thorough and sustained search by listening with passive sensors and probing with active sensors, both electromagnetic and acoustic. 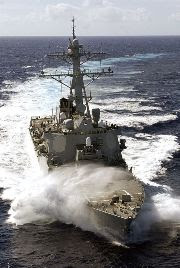 From a ship's perspective, it also involves frequent aggressive maneuvering to prevent an adversary from developing a firing solution, and the maneuvering must be done without jeopardizing the towed array sonar and torpedo countermeasures trailing thousands of feet behind the ship. Compounding the technical difficulties is a generation of young people that are accustomed to video-game speed and immediate gratification. The process of detecting, localizing and tracking a submarine, often when one only gets a moment's whiff of the enemy, can take days and test the endurance and dedication of the best crews. In fact, the pace of anti-submarine operations has led to ASW being nicknamed "awfully slow warfare" by some. But all of that can change in a moment. With skilled crews on both sides of the fight, more often than not ship-submarine engagements are like knife fights in the dark. They take place in very close quarters, the competitors often only have a notional idea of where the adversary is, there's a lot of ducking and weaving involved, and one or both of the fighters ends up very bad off. Such was the case for us. Day one was spent chasing phantoms in the deep blue. As day two of three dawned, though, the ticking clock forced the submarines to come out from under their rocks, for they no longer had the luxury of waiting for an unsuspecting ship to make a mistake. And, once the game was on, the pace was tasking, but the team held up and made a pretty good showing. Keep up the good work, the guys on the bird farm appreciate it. I miss CA Division. They are to notch - most of them smarter then I am. ASW was an art they taught me among other great life lessons. I still think of them often. I wish the Russell great hunting!